Marivaux’s Le Petit-Maître corrigé, revived by Clément Hervieu-Léger, had only been played twice before at the Comédie-Française in 1734. Infuriating for the French aristocracy, the play was promptly cancelled. The play indeed critiques the French aristocracy, the Parisian way of life, as well as the tradition of arranged weddings. 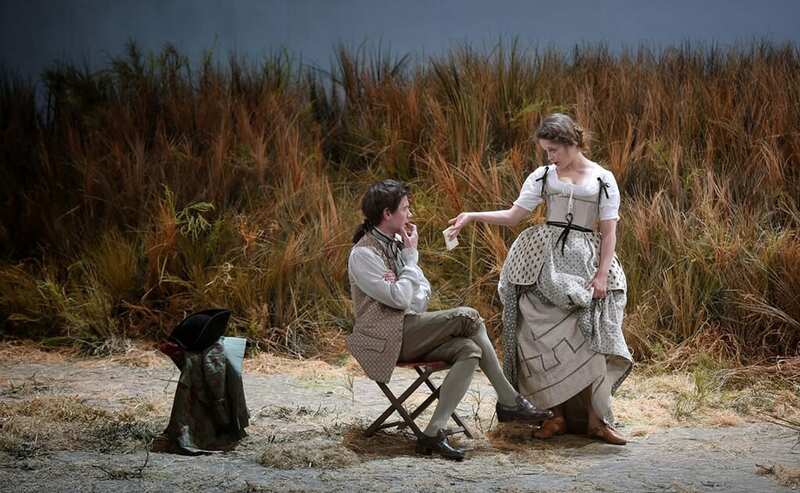 Hortense, a beautiful young woman from the countryside, has to marry Rosimond a noble Parisian. 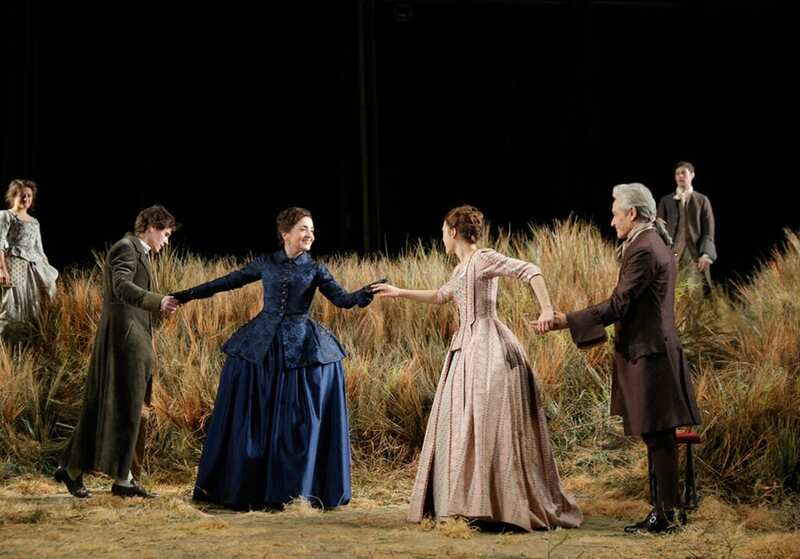 The scène takes place in the countryside, in a beautiful décor of tall grass. Taking her for granted, the young man does nothing to seduce the charming and wealthy woman. Their parents get involved. Simultaneously, Hortense’s servant and Rosimond’s servant express their desire to get married too. Between secrets, manipulations, and infidelities, the scene gets messy. 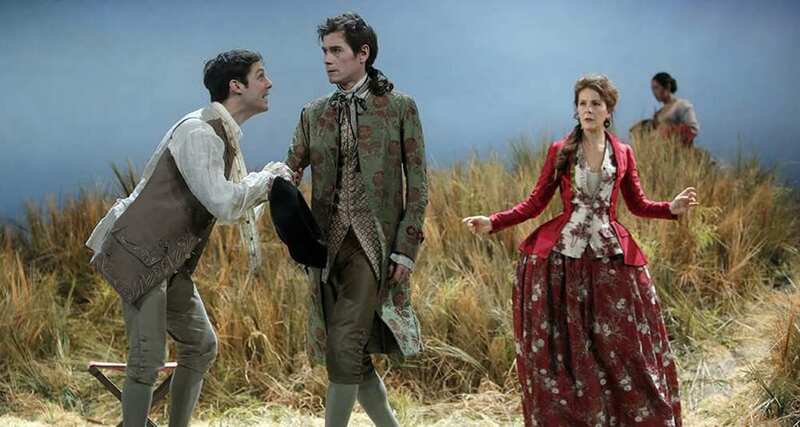 Adding to the prosperity of Marivaux’s dialogues, Clément Hervieu-Léger gives a unique personality to each character. 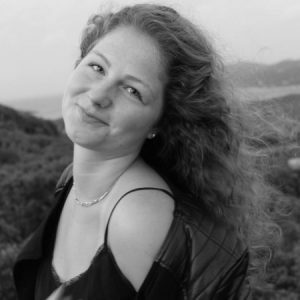 Hortense’s servant (Adeline D’Hermy) is charming, fun, malicious, united with her mistress she plans on fixing Rosimond. Her acting is flawless. Hortense’s father, a rich lord, establishes himself as a strong authoritive figure with his incredibly modulated voice. Draped in elegant flowing gowns and suits, the characters come and go, constantly rushing from one place to another. Although the narrative is slow, the staging is particularly successful as there is always movement. However, the play stretches out two hours, which, for a play mainly consisting of intense dialogues among the same protagonists, seems too long. Most of the teenagers who came along ended up dozing off. Nevertheless, the play was particularly fit for a Parisian audience. Mocking the mores of Parisians, laughter was often heard in the theatre. Rosimond is not ashamed to admit he has many lovers in the city. Compared to the ways of the countryside, Paris is shown as a city with no prohibition nor inhibition. In fact, a recent study precisely revealed that Parisians are sexually more shameless than the rest of France. Above the sharp criticism of these practices, the play delivers a powerful ode to love, defending the right to be plain, simple and one’s self. Ah l’amour !